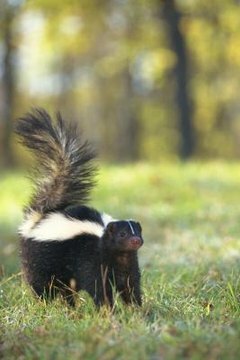 If you reside in an area that is chock full of diverse wildlife, you may notice the presence of skunks, if not by seeing them but by smelling their unforgettable, unpleasant spraying. The nocturnal creatures are not choosy about sustenance and are often enticed by bird seed of all things. Skunks are natural scavengers, and are omnivorous animals that will put almost anything they come across into their mouths. The preferred skunk diet includes items such as rodents, birds, bird eggs, insects and moles, according to the Washington Department of Fish and Wildlife. In terms of bugs, skunks love to feast a wide array of them, such as beetles, crickets, wasps, grasshoppers and bees. Other relatively common skunk dietary staples include grubs, chipmunks, acorns, snakes, lizards, fruits, turtle eggs, mushrooms, nuts, frogs, toads, spiders and carrion. Skunks also enjoy eating bird seed, which can sometimes be a nuisance when it comes to bird feeders. If you have an issue with skunks living in your garden, removing any bird feeders -- particularly during the night hours -- may help you solve the dilemma. Also, if you happen to spot any fallen bird seed below the feeder, be sure to always diligently clean it up -- the sooner the better. Not only do skunks have a taste for bird seed, they actually have a penchant for eating both the wee offspring and eggs of avian species too, particularly those that nest on the ground. In other words, skunks are just not really good news when it comes to pretty much anything involving birds -- yikes. Skunks do not only live outdoors. In fact, some people even keep the small black and white mammals as pets, as they are known for their laid-back and amiable temperaments. If you own a pet skunk, abstain from feeding him any bird seed, as it may lead to gastrointestinal upset for the little guy's rather delicate constitution. Sunflower seeds are especially problematic. If you have any questions regarding your skunk's specific dietary needs, speak to an exotic animal veterinarian before you put together any meal plans.